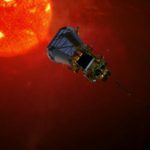 We are proud to be a supplier to NASA, JPL, the European Space Agency, Lockheed, and L-3, as well as numerous other aerospace organizations. 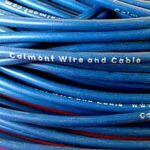 Calmont Wire & Cable’s ability to manufacture lighter, stronger, and less toxic cables makes it a valuable partner to many of the leading aerospace manufacturers and subcontractors. Being able to produce cable from a variety of fluoropolymers, as well as silicone rubber gives our aerospace customers design flexibility. 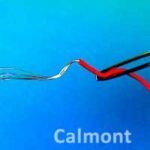 Whether you need a special length, modified wire configuration, or truly custom aerospace cable, Calmont can build whatever your applications require. The cables used in aerospace applications are quite diverse. The table below highlights some of the issues to be considered in different applications. Reference our Aerospace and Military Wire & Cable chart for Applications, Construction/Considerations, and Materials Used. Click here to enlarge. 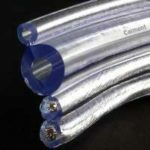 Silicone wire and cable is an excellent choice for high temperature, high voltage, low corona, and applications requiring extremely flexible wire or cable. 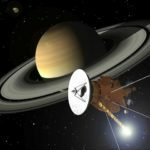 While silicone rubber has been known in the past as a moderate “out-gassing” material, Calmont now has a space rated silicone rubber material that will meet the current NASA out-gassing requirements without post baking. Aerospace and military have many applications that require weight conscious designs, in most cases may include the cable. 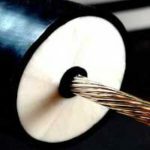 A major contributor to a cable’s weight is the braid or shield material. An alternative to copper braid is metal clad fibers. Aracon® is one such material which provides exceptional EMI shielding, strength, and flexibility. Typically switching from copper to Aracon® fiber can reduce the weight by 60% in the braid. Aracon® is combined with DuPont Kevlar® to provide high tensile strength and excellent conductivity. Calmont has vast experience working with Aracon® for space and military applications. The large number of fine threads and the tendency of yarn to flatten and spread give this material more shielding coverage than copper. 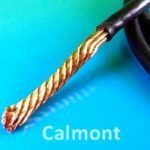 Calmont Wire & Cable has years of experience manufacturing cables with Aracon® for an assortment of projects including The Space-Based Infrared System (SIBRS). We can assist you with your design, suggest the braid construction and manufacture a high performance cable that will exceed your expectations.